Mets manager Terry Collins called it “an open competition” between Wheeler, Gsellman, and Lugo for the fifth starter spot. Sometimes there are good problems to have, like ones that are created due to depth. Based on talent alone, Wheeler is the front-runner for the job. However, Tommy John surgery and setbacks that arose during 2016 have raised questions about Wheeler perhaps being moved to the bullpen. Even if Wheeler does come back strong, innings limits will most likely force him to the pen at some point of the season. Gsellman emerged as a reliable late-season option for the Mets last year, posting a 4-2 record with a 2.42 ERA in eight appearances (seven starts). Gsellman is also coming off shoulder surgery on his non-throwing arm. What Gsellman has done a solid job of throughout his career is keeping the ball in the park. He has allowed only 26 homers in 539 innings logged during his professional career (0.4 per nine innings). Lugo was perhaps the most unlikely story of last year. A former 34th round pick from Centenary College, Lugo made his way up to the Mets and had a 5-2 mark with a 2.67 ERA. He started eight games and appeared in nine more in relief. Lugo has the least overpowering stuff of the three in competition, but there’s something to be said for being efficient in getting outs. An interesting stat to note: in plate appearances against Lugo after pitch 50 of a game, opponents hit a slim .153 (13-for-85). As stated above, with innings limits on the horizon because of his extended time away, Wheeler will be in the pen somewhere along the line. He has expressed his desire to not stay in that position and is determined to prove he can get his career back on track after it was sidelined for two years. Gsellman and Lugo will provide healthy competition as they both were saviors for the team last season, and at least one of the two should get an opportunity at some point to be in that fifth spot. 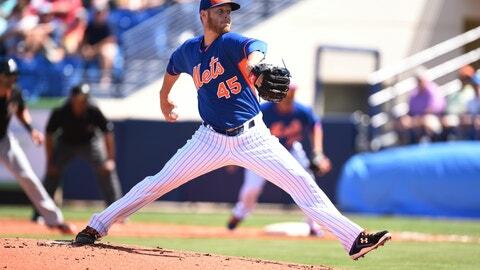 Maybe we’ll see a scenario where Wheeler starts off in the pen to keep his innings down early and makes an eventual transition into the rotation as the Mets get further into the season. There are a variety of ways this situation can be handled and the Mets can take comfort in the fact that they have the depth to explore different options.